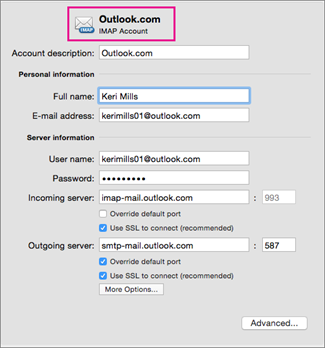 For steps on how to use these settings to set up an initial IMAP account or to add more accounts in the Outlook for Mac Accounts box, see Add an email account to Outlook. This is how your account is labeled in Outlook. If you have more than one account, choose descriptive names so you can better differentiate between your accounts. This is how your name appears in the From field of email messages you send. Type your complete email address, such as someone@example.com. Depending on your email provider, this is usually either your full email address or the part of your email address before the "@" symbol. This is the password you'll use to access your account. The password is usually case-sensitive. The incoming mail server for an IMAP account may also be called the IMAP server. For example, if your email provider is example.com, the incoming mail server is likely imap-mail.example.com. This server sends your messages. It may also be called the SMTP server. For example, if your email provider is example.com, the outgoing mail server is likely smtp-mail.example.com.